In today’s highly fragmented media environment, billboards have proven to be a highly effective way to reach constituents and deliver your message during both the political campaign season and throughout the year. From promoting campaign events to fundraising to sharing views on hot button political issues or simply elevating awareness of your candidate and campaign, billboards are seen by millions of voters on their commutes and while living their daily lives, most of whom skip past television commercials on their DVRs. Need proof? During the 2017 election cycle, 75% of candidates in the Cincinnati area who advertised with Lamar won at the polls! Out of home advertising is always on. A strategic campaign from Lamar can help you connect with voters at any point during the year. 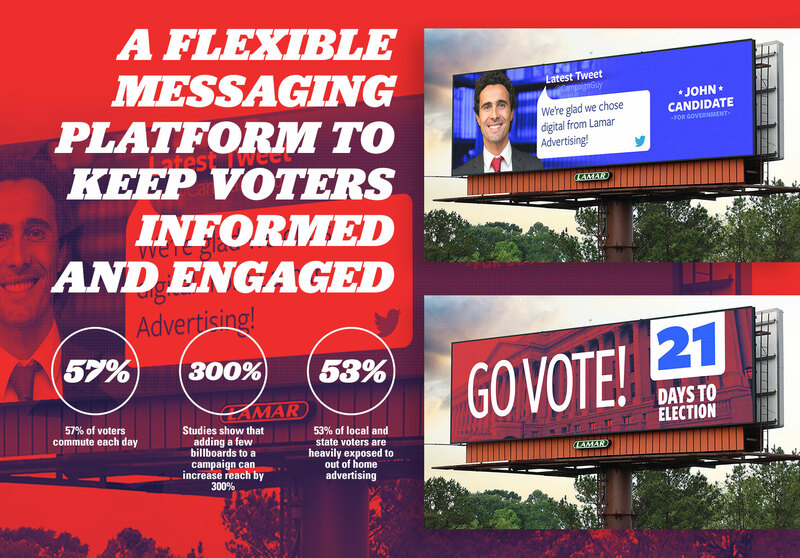 Target voters in key primary and battleground markets with the largest network of digital billboards in the U.S.
Our 2,800+ digital billboards deliver millions of impressions to voters nationwide each day! Our digital platform offers campaigns the flexibility of immediate, no-cost message changes at speeds faster than both broadcast and print media. Broadcast news and real-time updates from your website or social media. Keep voters engaged with relevant messaging. Change your message as often as you want - no production cost. Display live countdowns for upcoming appearances or remind people to vote. Contact us to get in touch with your local office. Someone will respond to you shortly.